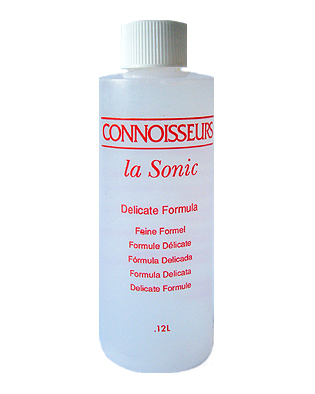 120ml of Connoisseurs La Sonic Delicate Formula jewellery cleaner concentrate. Makes 600ml of cleaning solution. 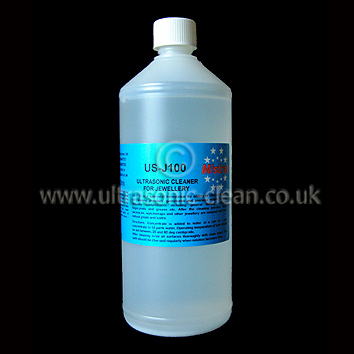 Specially formulated for use in ultrasonic cleaners to clean silver. This solution is concentrated and must be mixed with water prior to use. Measurement guide for ease of use is printed down the side of the bottle. This product is for use on silver. A specialist formulation for adding to Ultrasonic baths for cleaning jewellery, gemstones and precious metals. It safely removes contaminants including general soiling, oxidation, fingerprints and grease etc. After the cleaning process, rings, necklaces, watchstraps and other jewellery are retored with their natural gleam and lustre. Safe to use on all jewellery items. Concentrate is added to water at a rate of 1 part concentrate to 10 parts of water. Operating temperature of bath should be set between 20 and 60 degrees centigrade.